The Vault apron-front kitchen sink combines the sleek, modern look of stainless steel with traditional farmhouse style. Made to seamlessly coordinate with a variety of decors, this sink features a single bowl with tightly angled corners to maximize basin space, and a top-mount design for easy installation and use on most laminate countertops. Vault's ultra-flat rim makes it easy to wipe from the counter directly into the sink. Apron height allows sink to be used in most standard cabinetry or retrofitted to existing standard cabinetry. 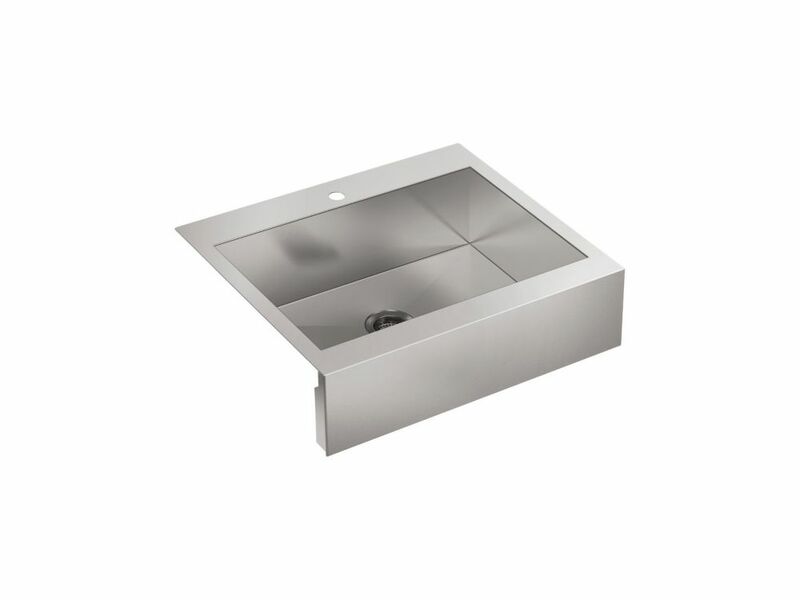 This single bowl undermount sink is made In Germany with unparalleled quality and durability. The premium 18 gauge, 304 series stainless steel features straight sides and a flat bottom to maximize bowl capacity. The off-centred, rear-positioned drain hole maximizes usable space under the counter. Available in store by Special Order Only. See associate for details. The Cape Dory sink is a kitchen classic, with its generous single bowl that simplifies the task of washing large pots and pans. Crafted from enameled cast iron, this sink resists scratching, burning, and staining for years of beauty and reliable performance. The Undertone utility sink is an ideal choice for kitchens and laundry areas. Constructed from durable stainless steel, this deep basin offers generous room for household tasks. An engineered sound-absorption system significantly reduces dishwashing and disposal noise. Vault Top Mount Stainless Steel 29.75X24.313X9.313 1-Hole Single Bowl Kitchen Sink The Vault apron-front kitchen sink combines the sleek, modern look of stainless steel with traditional farmhouse style. Made to seamlessly coordinate with a variety of decors, this sink features a single bowl with tightly angled corners to maximize basin space, and a top-mount design for easy installation and use on most laminate countertops. Vault's ultra-flat rim makes it easy to wipe from the counter directly into the sink. Vault Top Mount Stainless Steel 29.75X24.313X9.313 1-Hole Single Bowl Kitchen Sink is rated 3.9 out of 5 by 14. Rated 3 out of 5 by Wills from It is beautiful. Easy to install. That being said it seems to scratch very easily- and after only... It is beautiful. Easy to install. That being said it seems to scratch very easily- and after only one week. We haven't even really used it and yet it also already has signs of oxidation along one edge. Frustrating. Rated 5 out of 5 by Thisoldhouse from Remodeling the kitchen cabinets the sink was a perfect retrofit. I ordered the templates from Koh... Remodeling the kitchen cabinets the sink was a perfect retrofit. I ordered the templates from Kohler and they were quick to ship before our ordered the sink. Rated 4 out of 5 by DIYinKY from This sink is beautiful and we've received numerous compliments on it. The inside of the sink does... This sink is beautiful and we've received numerous compliments on it. The inside of the sink does "scratch" easily. (We already have several scratches and it was installed about 2 weeks ago. No scratches on the exterior, however.) But if farmhouse is your style, a few scratches only add to the aesthetic! I do wish the basin angles were a bit steeper. It takes a little extra rinsing to get everything down the drain. However, I wouldn't let any of this deter you from purchasing it. The sink shipped very quickly, and Home Depot had the best price we could find! Rated 5 out of 5 by Simple from Easy to install and looks great. ... Easy to install and looks great. Rated 2 out of 5 by Anonymous from Quality doesn't match the price tag The style of this sink is great and I liked the fact that it gave me the option of having an apron front sink without having to do an undermount or deal with a more complicated cutout in my countertops. However, within 24-48 hours, the water alone in the sink caused generalized small rust spots in the basin that are fairly noticeable. The grain of the stainless steel is pretty rough and doesn't seem like it's a high quality, polished finish. After using stainless steel cleaners and scrubbing to no avail, I contacted Kohler's customer service about the rust and the quality of the sink and I was merely told to find a better rust remover. Overall, I'm disappointed with Kohler and the quality of this product. Rated 4 out of 5 by Anonymous from Good product for the price. ... Good product for the price.